"Conquista" redirects here. 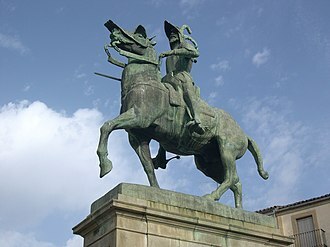 For other uses, see Conquista (disambiguation). 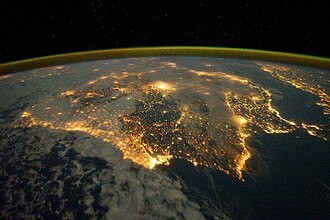 Iberian territory of Crown of Castile. . 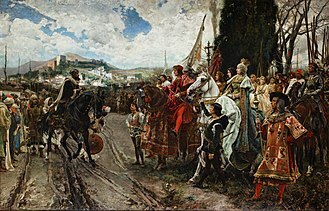 The Catholic Monarchs Isabella of Castile, Queen of Castile and her husband King Ferdinand, King of Aragon, pursued a policy of joint rule of their kingdoms and created a single Spanish monarchy. 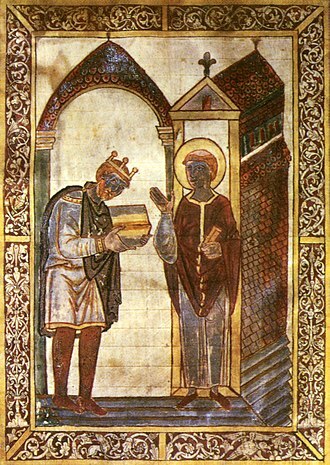 Even though Castile and Aragon were ruled jointly by their respective monarchs, they remained separate kingdoms. The Catholic Monarchs gave official approval for the plans of Genoese mariner Christopher Columbus for a voyage to reach India by sailing West. The funding came from the queen of Castile, so the profits from Spanish expedition flowed to Castile. 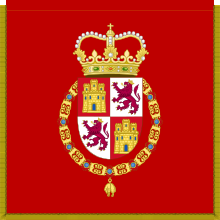 In the extension of Spanish sovereignty to its overseas territories, authority for expeditions of discovery, conquest, and settlement resided in the monarchy. Columbus made four voyages to the West Indies as the monarchs granted Columbus the governorship of the new territories, and financed more of his trans-Atlantic journeys. 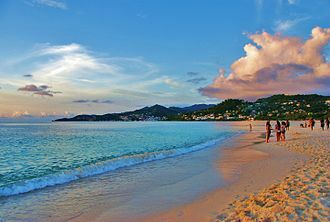 He founded La Navidad on the island later named Hispaniola (now divided into Haiti and the Dominican Republic), in what is the present-day Haiti on his first voyage. After its destruction by the indigenous Taino people, the town of Isabella was begun in 1493, on his second voyage. In 1496 his brother, Bartholomew, founded Santo Domingo. 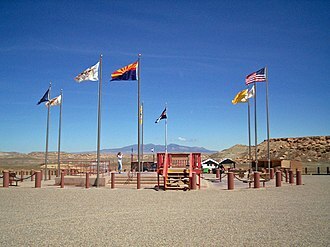 By 1500, despite a high death rate, there were between 300 and 1000 Spanish settled in the area. 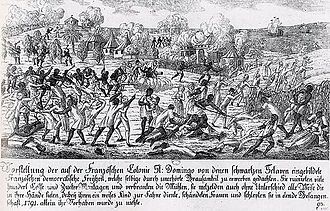 The local Taíno people continued to resist, refusing to plant crops and abandoning their Spanish-occupied villages. 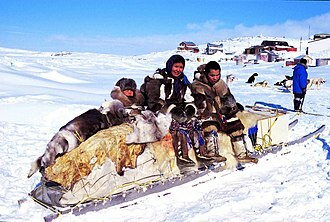 The first mainland explorations were followed by a phase of inland expeditions and conquest. In 1500 the city of Nueva Cádiz was founded on the island of Cubagua, Venezuela, followed by the founding of Santa Cruz by Alonso de Ojeda in present-day Guajira peninsula. 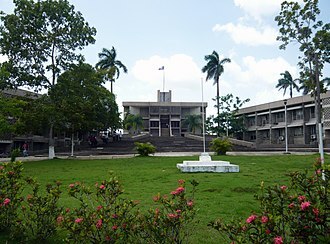 Cumaná in Venezuela was the first permanent settlement founded by Europeans in the mainland Americas, in 1501 by Franciscan friars, but due to successful attacks by the indigenous people, it had to be refounded several times, until Diego Hernández de Serpa's foundation in 1569. The Spanish founded San Sebastian de Uraba in 1509 but abandoned it within the year. 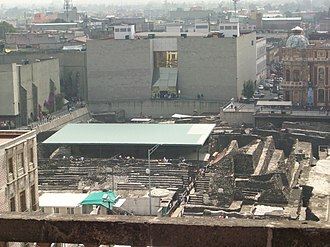 There is indirect evidence that the first permanent Spanish mainland settlement established in the Americas was Santa María la Antigua del Darién. The Spanish conquest of Mexico is generally understood to be the Spanish conquest of the Aztec Empire (1519–21) which was the base for later conquests of other regions. 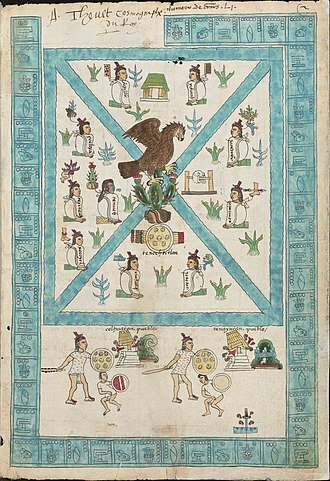 Later conquests were protracted campaigns with less spectacular results than the conquest of the Aztecs. The Spanish conquest of Yucatán, the Spanish conquest of Guatemala, the war of Mexico's west, and the Chichimeca War in northern Mexico expanded Spanish control over territory and indigenous populations. But not until the Spanish conquest of Peru was the conquest of the Aztecs matched in scope by the victory over the Inca empire in 1532. 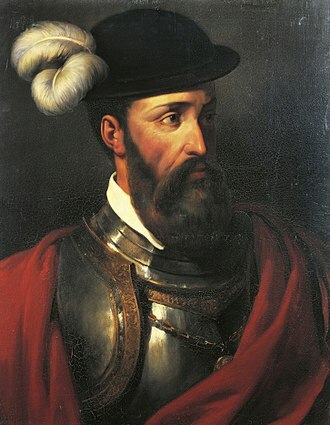 The Spanish conquest of the Aztec empire was led by Hernán Cortés. 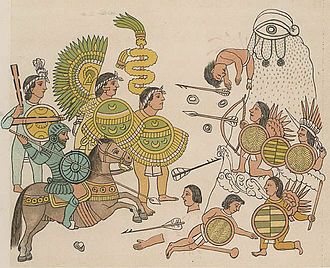 The victory over the Aztecs was relatively quick, from 1519 to 1521, and aided by his Tlaxcala and other allies from indigenous city-states or altepetl. These polities allied against the Aztec empire, to which they paid tribute following conquest or threat of conquest, leaving the city-states' political hierarchy and social structure in place. 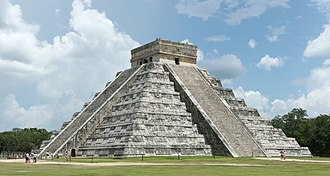 The Spanish conquest of Yucatán was a much longer campaign, from 1551 to 1697, against the Maya peoples in the Yucatán Peninsula of present-day Mexico and northern Central America. 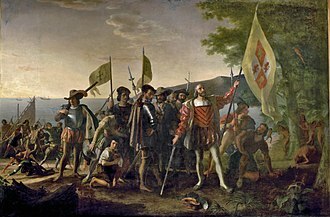 Hernán Cortés' landing ashore at present day Veracruz and founding the Spanish city there on April 22, 1519 marked the beginning of 300 years of Spanish hegemony over the region. 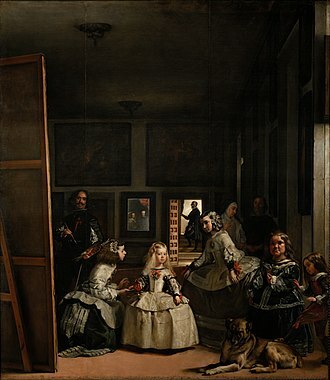 The assertion of royal control over the Kingdom of New Spain and the initial Spanish conquerors took over a decade, with importance of the region meriting the creation of the Viceroyalty of New Spain. 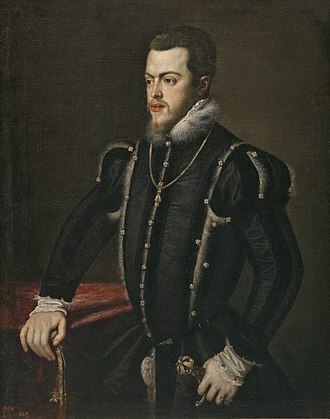 Established by Charles V in 1535, the first viceroy was Don Antonio de Mendoza. 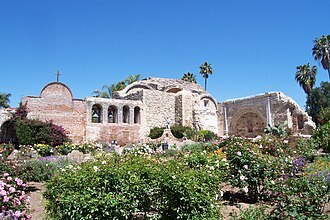 Spain colonized and exerted control of Alta California through the Spanish missions in California until the Mexican secularization act of 1833. 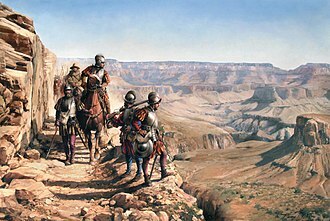 In 1532 at the Battle of Cajamarca a group of Spaniards under Francisco Pizarro and their indigenous Andean Indian auxiliaries native allies ambushed and captured the Emperor Atahualpa of the Inca Empire. It was the first step in a long campaign that took decades of fighting to subdue the mightiest empire in the Americas. In the following years Spain extended its rule over the Empire of the Inca civilization. 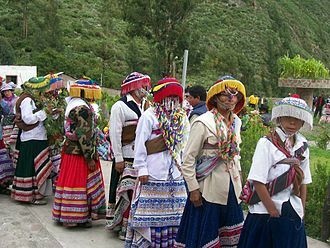 The Spanish took advantage of a recent civil war between the factions of the two brothers Emperor Atahualpa and Huáscar, and the enmity of indigenous nations the Incas had subjugated, such as the Huancas, Chachapoyas, and Cañaris. In the following years the conquistadors and indigenous allies extended control over Greater Andes Region. The Viceroyalty of Perú was established in 1542. The last Inca stronghold was conquered by the Spanish in 1572. 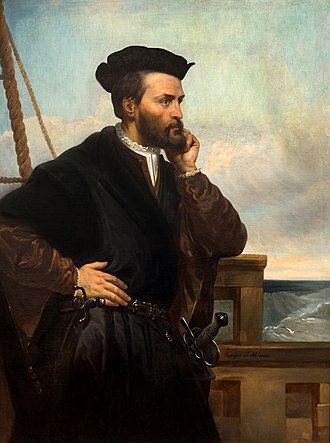 European explorers arrived in Río de la Plata in 1516. Their first Spanish settlement in this zone was the Fort of Sancti Spiritu established in 1527 next to the Paraná River. 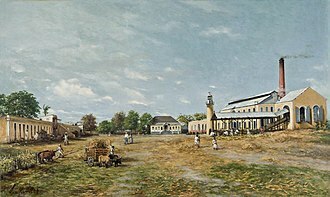 Buenos Aires, a permanent colony, was established in 1536 and in 1537 Asunción was established in the area that is now Paraguay. 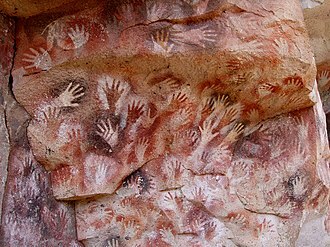 Buenos Aires suffered attacks by the indigenous peoples that forced the settlers away, and in 1541 the site was abandoned. A second (and permanent) settlement was established in 1580 by Juan de Garay, who arrived by sailing down the Paraná River from Asunción (now the capital of Paraguay). He dubbed the settlement "Santísima Trinidad" and its port became "Puerto de Santa María de los Buenos Aires." 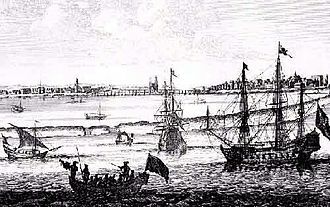 The city came to be the head of the Governorate of the Río de la Plata and in 1776 elevated to be the capital of the new Viceroyalty of the Río de la Plata. Between 1537 and 1543, six Spanish expeditions entered highland Colombia, conquered the Muisca Confederation, and set up the New Kingdom of Granada (Spanish: Nuevo Reino de Granada). 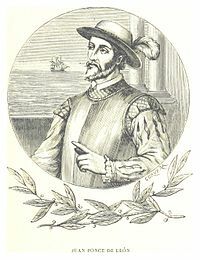 Gonzalo Jiménez de Quesada was the leading conquistador with his brother Hernán second in command. It was governed by the president of the Audiencia of Bogotá, and comprised an area corresponding mainly to modern-day Colombia and parts of Venezuela. The conquistadors originally organized it as a captaincy general within the Viceroyalty of Peru. 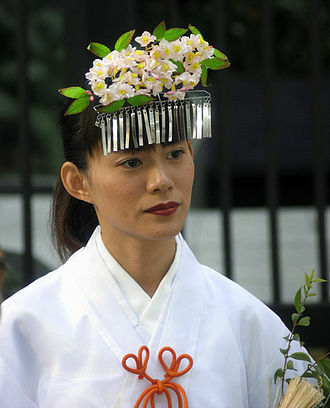 The crown established the audiencia in 1549. Ultimately, the kingdom became part of the Viceroyalty of New Granada first in 1717 and permanently in 1739. After several attempts to set up independent states in the 1810s, the kingdom and the viceroyalty ceased to exist altogether in 1819 with the establishment of Gran Colombia. Spain's administration of its colonies in the Americas was divided into the Viceroyalty of New Spain 1535 (capital, Mexico City), and the Viceroyalty of Peru 1542 (capital, Lima). 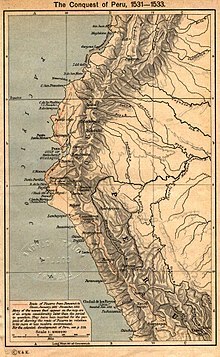 In the 18th century the additional Viceroyalty of New Granada 1717 (capital, Bogotá), and Viceroyalty of Rio de la Plata 1776 (capital, Buenos Aires) were established from portions of the Viceroyalty of Peru. The change diminished the political and economic power of the viceroyalty and opened formal connections between the mining district of Upper Peru and the port of Buenos Aires. The system of crown rule evolved from the era of the Catholic Monarchs, which established the Council of the Indies, to the establishment of viceroyalties in Mexico and Peru following their conquests in the Habsburg era, and then into an Intendant system in the eighteenth century as part of the Bourbon Reforms. 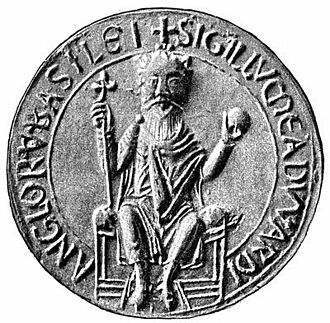 The reform was aimed at increasing crown control over its colonies, raising more revenue, and promoting greater efficiency. 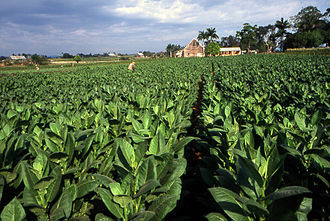 Captaincy General of Cuba (until 1898) – Included in this captaincy general until 1819 was Florida. Spanish colonialization in the Americas. 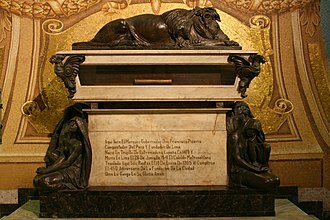 During the Napoleonic Peninsular War in Europe between France and Spain, assemblies called juntas were established to rule in the name of Ferdinand VII of Spain. The Libertadores (Spanish and Portuguese for "Liberators") were the principal leaders of the Spanish American wars of independence. They were predominantly criollos (Americas-born people of European ancestry, mostly Spanish or Portuguese), bourgeois and influenced by liberalism and in some cases with military training in the mother country. 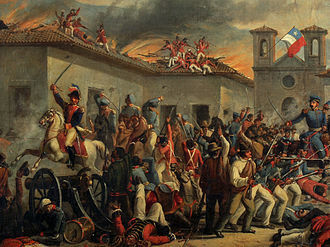 In 1809 the first declarations of independence from Spanish rule occurred in the Viceroyalty of New Granada. The first two were in present-day Bolivia at Sucre (May 25), and La Paz (July 16); and the third in present-day Ecuador at Quito (August 10). In 1810 Mexico declared independence, with the Mexican War of Independence following for over a decade. 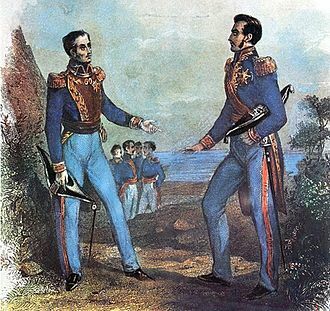 In 1821 Treaty of Córdoba established Mexican independence from Spain and concluded the War. 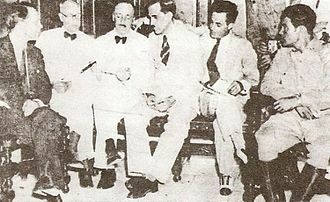 The Plan of Iguala was part of the peace treaty to establish a constitutional foundation for an independent Mexico. These began a movement for colonial independence that spread to Spain's other colonies in the Americas. 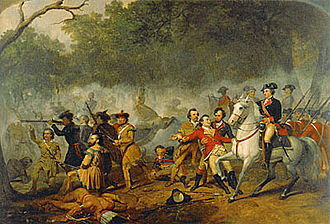 The ideas from the French and the American Revolution influenced the efforts. All of the colonies, except Cuba and Puerto Rico, attained independence by the 1820s. 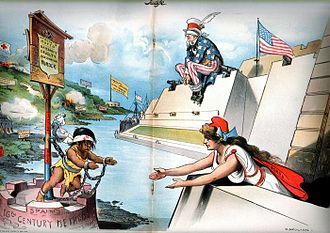 The British Empire offered support, wanting to end the Spanish monopoly on trade with its colonies in the Americas. 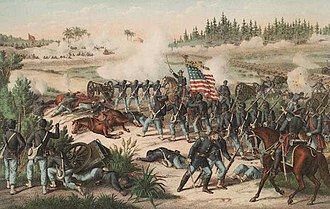 In 1898, the United States achieved victory in the Spanish–American War with Spain, ending the Spanish colonial era. 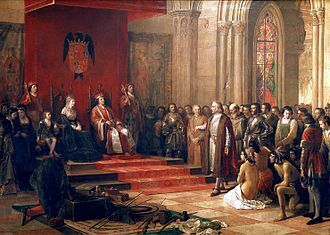 Spanish possession and rule of its remaining colonies in the Americas ended in that year with its sovereignty transferred to the United States. 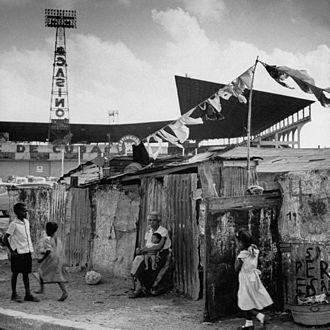 The United States took occupation of Cuba, the Philippines, and Puerto Rico. Puerto Rico continues to be a possession of the United States, now officially continues as a self-governing unincorporated territory. 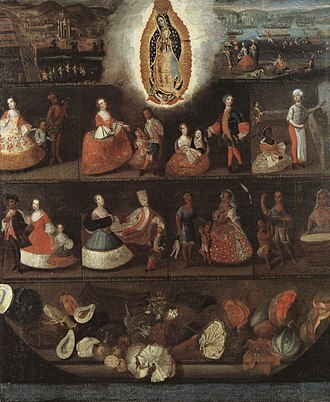 It has been estimated that over 1.86 million Spaniards emigrated to Latin America in the period between 1492 and 1824, with millions more continuing to immigrate following independence. In Hispaniola, the indigenous Taíno pre-contact population before the arrival of Columbus of several hundred thousand had declined to sixty thousand by 1509. 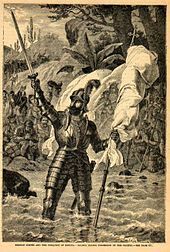 Although population estimates vary, Dominican friar Bartolomé de las Casas, the "Defender of the Indians" estimated there were 6 million (6,000,000) Taíno and Arawak in the Caribbean at the time of Columbus's arrival in 1492. 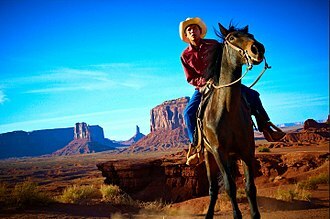 The population of the Native American population in Mexico declined by an estimated 90% (reduced to 1–2.5 million people) by the early 17th century. In Peru, the indigenous Amerindian pre-contact population of around 6.5 million declined to 1 million by the early 17th century. 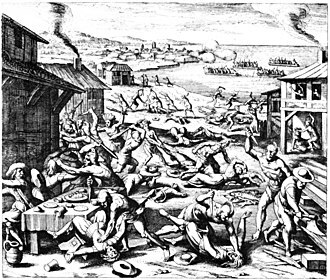 The overwhelming cause of the decline in both Mexico and Peru was infectious diseases, such as smallpox and measles, although the brutality of the Encomienda also played a significant part in the population decline. Of the history of the indigenous population of California, Sherburne F. Cook (1896–1974) was the most painstakingly careful researcher. 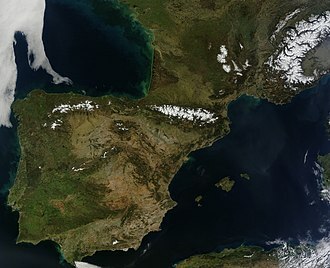 From decades of research, he made estimates for the pre-contact population and the history of demographic decline during the Spanish and post-Spanish periods. 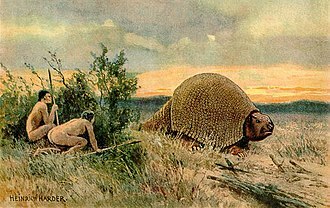 According to Cook, the indigenous Californian population at first contact, in 1769, was about 310,000 and had dropped to 25,000 by 1910. The vast majority of the decline happened after the Spanish period, during the Mexican and US periods of Californian history (1821–1910), with the most dramatic collapse (200,000 to 25,000) occurring in the US period (1846–1910). ^ Ida Altman, S.L. Cline, and Javier Pescador, The Early History of Greater Mexico, Pearson, 2003 pp. 35–36. ^ Tibesar, A.S. (1957). "The Franciscan Province of the Holy Cross of Espanañola, 1505–1559". 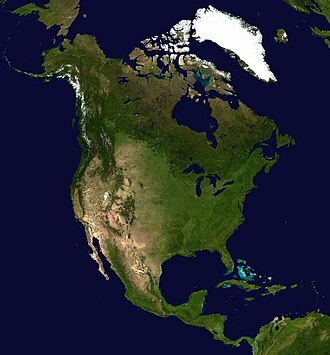 The Americas. 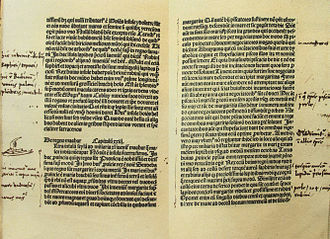 13 (4): 377–389. doi:10.2307/979442. JSTOR 979442. ^ Robert S. Chamberlain, The Conquest and Colonization of Yucatan. Washington DC: Carnegie Institution. ^ Ida Altman, The War for Mexico's West. Albuquerque: University of New Mexico Press 2010. ^ Philip W. Powell, Soldiers, Indians, and Silver: North America's Last Frontier War. Tempe: Center for Latin America Studies, Arizona State University 1975. First published by University of California Press 1952. ^ MacIas, Rosario Marquez; MacÍas, Rosario Márquez (1995). 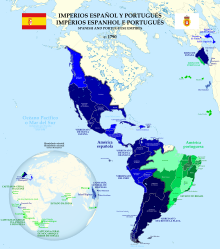 La emigración española a América, 1765-1824. ISBN 9788474688566. ^ "The Story Of... Smallpox". Pbs.org. Retrieved 2019-03-02. ^ Baumhoff, Martin A. 1963. Ecological Determinants of Aboriginal California Populations. University of California Publications in American Archaeology and Ethnology 49:155–236. Brading, D. A., The First America: the Spanish Monarchy, Creole Patriots, and the Liberal State, 1492–1867 (Cambridge: Cambridge University Press, 1993). Hanke, Lewis. The Spanish Struggle for Justice in the Conquest of America (Boston: Little, Brown, and Co., 1965). Portuondo, María M. Secret Science: Spanish Cosmography and the New World (Chicago: Chicago UP, 2009). Dutch trading posts and plantations in the Americas precede the much wider known colonization activities of the Dutch in Asia. While the first Dutch fort in Asia was built in 1600, actual colonization, with Dutch settling in the new lands, was not as common as with other European nations. Hudson entered the Upper New York Bay by sailboat, heading up the Hudson River, Block Island and Block Island Sound are befittingly named in his honor. Block quickly ascended and became Manhattans first monopolist, after some early trading expeditions, the first Dutch settlement in the Americas was founded in 1615, Fort Nassau, on Castle Island along the Hudson, near present-day Albany. The settlement served mostly as an outpost for trading in fur with the native Lenape tribespeople, both forts were named in honor of the House of Orange-Nassau. By 1621, the United Provinces had charted a new company, a monopoly in the Americas and West Africa. The WIC sought recognition as founders of the New World – which they ultimately did as founders of a new Province in 1623 and that year, another Fort Nassau was built on the Delaware River near Gloucester City, New Jersey. The colony expanded to outlying areas at Pavonia, Bronx, on the Connecticut River, Fort Huys de Goede Hoop was completed in 1633 at present day Hartford. By 1636, the English from Newtown settled on the side of the Little River. In the Treaty of Hartford, the border of New Netherland was retracted to western Connecticut and by 1653, settlements at Fort Nassau and the short-lived Fort Beversreede were abandoned and consolidated at Fort Casimir. By 1655 Fort Christina, sitting in what is today Wilmington, had already been renamed Fort Altena, not all inhabitants of New Netherlands, Manahattas first European colonizers, were ethnically Dutch, but in reality came from many European countries. In 1664, an English naval expedition ordered by Prince James, Duke of York and of Albany sailed in the harbor at New Amsterdam, being greatly outnumbered, Director-General Peter Stuyvesant surrendered after negotiating favorable articles of capitulation. The Province took a new name, New York, Fort Orange was renamed Fort Albany. 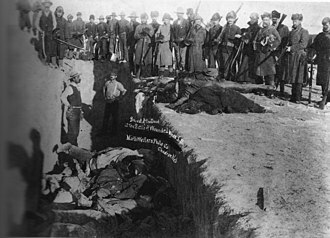 Genocide is intentional action to destroy a people in whole or in part. The hybrid word genocide is a combination of the Greek word génos, the United Nations Genocide Convention, which was established in 1948, defines genocide as acts committed with intent to destroy, in whole or in part, a national, racial or religious group. The term genocide was coined in a 1943 book responding to mass murder of populations in the 20th century, in 1943, Raphael Lemkin created the term genocide in his book Axis Rule in Occupied Europe. The book describes the implementation of Nazi policies in occupied Europe, the term described the systematic destruction of a nation or people, and the word was quickly adopted by many in the international community. The word genocide is the combination of the Greek prefix geno-, Lemkin defined genocide as follows, Generally speaking, genocide does not necessarily mean the immediate destruction of a nation, except when accomplished by mass killings of all members of a nation. 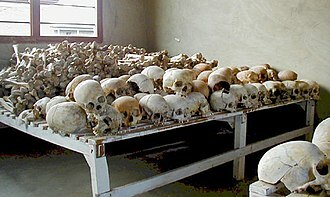 The preamble to the 1948 Genocide Convention notes that instances of genocide have taken place throughout history. Lemkins lifelong interest in the murder of populations in the 20th century was initially in response to the killing of Armenians in 1915. He dedicated his life to mobilizing the international community, to together to prevent the occurrence of such events. In a 1949 interview, Lemkin said I became interested in genocide because it happened so many times and it happened to the Armenians, after the Armenians, Hitler took action. In 1948, the UN General Assembly adopted the Convention on the Prevention, the CPPCG was adopted by the UN General Assembly on 9 December 1948 and came into effect on 12 January 1951. The USSR argued that the Conventions definition should follow the etymology of the term, and may have feared greater international scrutiny of its own Great Purge. Other nations feared that including political groups in the definition would invite international intervention in domestic politics. Canada first came under British rule with the Treaty of Paris which ceded New France, of which Canada was a part, to the British Empire. Gradually, other territories and provinces that were part of British North America would be added to Canada. 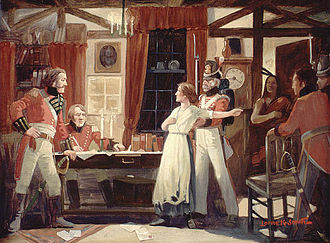 The Royal Proclamation of 1763 enlarged the colony of Canada under the name of the Province of Quebec, with the Act of Union 1840 Upper and Lower Canada were joined to become the United Province of Canada. 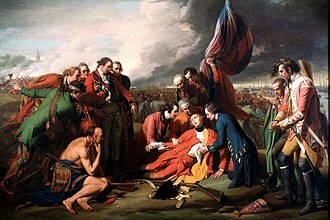 A number of other British colonies, such as Newfoundland and British Columbia, in North America, the Seven Years War officially ended with the signing of the Treaty of Paris on February 10,1763. As part of the treaty, France ceded all North American lands to Britain, except Louisiana, the Quebec Act became one of the Intolerable Acts that infuriated the thirteen British colonies in what would become the United States of America. 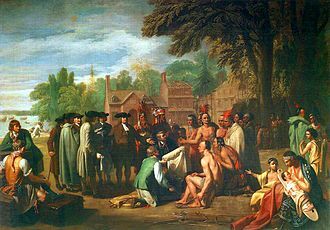 In Acadia, the British had expelled French-speaking populations in 1755 from Acadia to Louisiana, creating the Cajun population, in the former French territory of Acadia, the British were confronted by a relatively large and well-established Catholic Mikmaq and Wabanaki Confederacy. 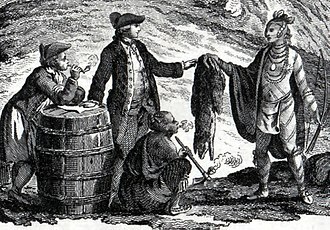 The British Conquest of Acadia happened in 1710, much earlier than in what would become the rest of modern-day Canada, the Mikmaq never ceded land to either France or England. 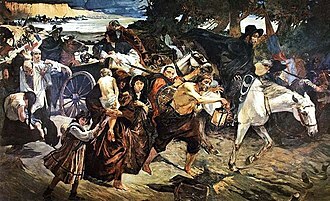 The first immigration of Protestants happened in the province with the founding of Halifax, the establishment of Halifax sparked Father Le Loutres War, which, in turn, led to the British expelling the Acadians from the region during the French and Indian War. As they captured Cape Breton Island and Prince Edward Island, the few Acadians who managed to return to the area have created the contemporary Acadian society. Once the land was emptied, other settlements were formed by New England Planters, in 1775, American revolutionaries attempted to push their insurrection into Quebec. The habitants were divided, in areas, there was significant support. 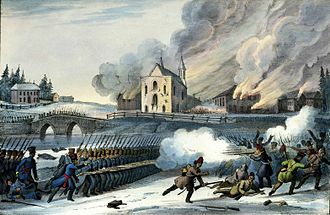 The Patriots laid siege to Fort Saint-Jean, capturing it and Montreal in November 1775 and they marched on Quebec City, where an attempt to take the city on December 31,1775, failed. The Hamidian massacres were massacres of Armenians in the Ottoman Empire during the mid-1890s, with estimates of the dead ranging from 80,000 to 300,000.